The bond between a mother and daughter is complex. It can be nonexistent or the best friendship ever. Brooke Green has lived with the pain of losing her mother since she was seven years old. Her father did the best he could raising her but couldn't possibly fill that void. Funerals bring out family secrets and Brooke's father's funeral was no exception. Brooke received shocking news: her mother, Sarah, was actually alive. Brooke doesn't understand how a mother could just abandon her family so she starts searching for Sarah. She finds her living in Atlanta with a brand new family. In an effort to get answers, Brooke works her way into their family for revenge. What a doozy of a novel! Very well done and page-turning. It is twisted and full of drama. I cannot imagine how a mother could abandon her child, no matter how complicated life may seem. But the author does a good job of conveying emotions of the characters. I dropped my jaw on a couple occasions while reading. Go ahead and add Seeking Sarah to your TBR piles; it is well worth the read. 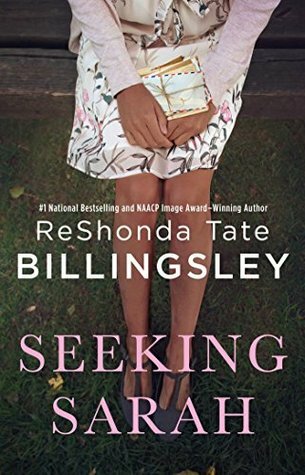 Happy Belated Pub Day, ReShonda Tate Billingsley. Seeking Sarah is now available.